An introverted teenage girl and her protective cousin head to camp for the summer. A short time after arriving, a string of murders breaks out, threatening to end their summer early, if they make it out alive at all. With the success of "Friday the 13th" back in 1980, horror filmmakers would spawn numerous summer camp slasher flicks in the years that followed. "Sleepaway Camp" is one of those films. This movie is written and directed Robert Hiltzik and it is his feature film debut. In fact, it would be the only feature he would write or direct until the release of the series' only official sequel: the direct-to-video "Return to Sleepaway Camp," which came out in 2008. The film stars Felissa Rose and Jonathan Tierston as Angela and Ricky, two cousins who are spending their summer at Camp Arawak. Angela is very introverted and doesn't talk much, which makes her a target for the numerous camp bullies. Her cousin Ricky is very protective and lashes out violently at anyone who messes with her. One might think he would even kill to protect her. When campers and counselors start turning up dead, the camp's head honcho Mel, played by Mike Kellen, tries to write them off as accidents, as one would do because money is clearly more important than the lives of a few camper kids. In order to save his camp, not necessarily the lives of the campers, just his camp, he is now determined to catch the killer. This is a little bit of a whodunit-style mystery, though it doesn't really do a great job at creating a whole heck of a lot of suspects. The possible list of suspects is at max three people deep and really, there are only two solid suspects if we are truly looking at motives. Though the mystery aspect of "Sleepaway Camp" is weak, there are some cool looking death scenes with a lot of creative makeup work on the corpses. Boiling water and bees make for neat, gross looking gore effects. The film does capture summer camp life pretty well, mainly the fact that kids can be total dicks to each other when given a lot of free time and little supervision. The ending of this feature is probably the most well-known part of it. It is shocking and jaw-dropping, only because of how out of left field it is and how far away it was from the conventional norms of the time. BigJ had seen this movie before, but I certainly had no clue where it was going. 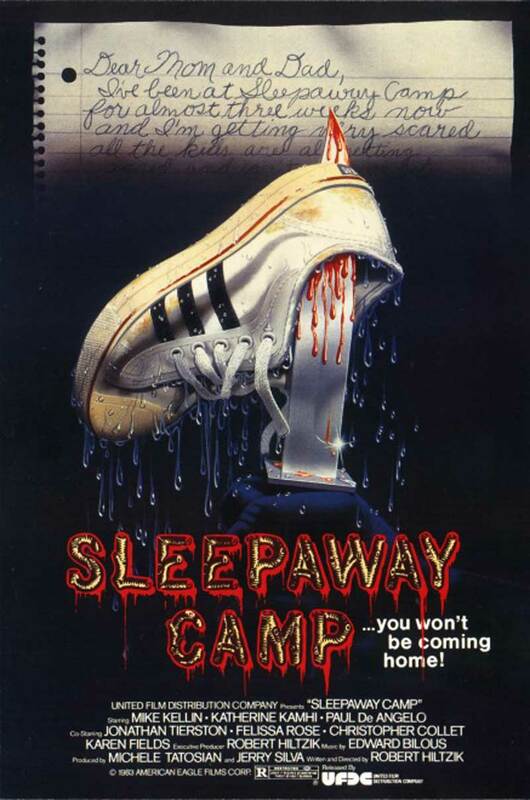 Despite some mediocre acting, the worst of 80's fashion, some extremely questionable plot points which are super dated and unbearably creepy to watch, and heaps of cheesy dialogue, "Sleepaway Camp" is still a decent horror flick, especially if you don't know the ending.